Piano strings, mechanical saltwater dimmer, plywood transducer table, electromagnetic pickups, stepper motor actuated light dimmer, hardware, electromagnetic coils, custom circuits, drums. 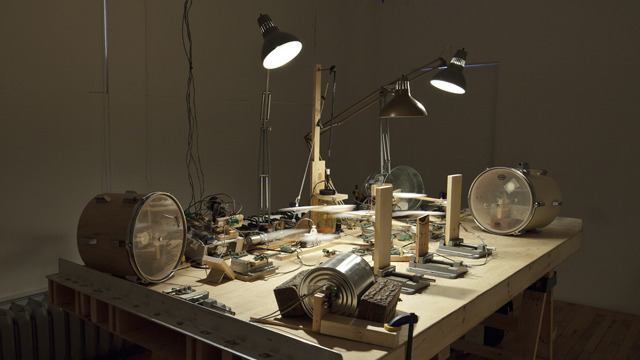 Instrumentation is an electro-mechanical sound installation inspired by resonance. The gallery installation preserves a sense of the makeshift, having evolved from studio experiments, using a limited palette of tools and readily available materials. Spanning two separate but connected spaces, different aspects of the work are presented in each. Unlikely loudspeakers improvised from buckets, drums, salvaged windows and hand-wound electromagnetic coils occupy a main room. These found-object resonators amplify the remainder of the installation situated in a less predominant room. Here, a plywood work-table serves as an acoustic transducer for electromagnetically activated piano wires, and as the main staging area for an assembly of machine ‘performers.’ Each lethargically performs a repetitive task, contributing to an endlessly fluctuating sound track of shimmering harmonics, sudden crescendos and arrhythmic beats. By letting machines run the show, a temporary space opens for contemplation of the forces at work in the environment around us. Exploring the basic physical ‘magic’ of resonance, present within our everyday machines, structures and systems, reveals that we are subject to material laws that are fundamentally mysterious and outside of our absolute command. I look at what I make as the electro-mechanical equivalents of short stories. Peter Flemming: Instrumentation (demonstration no. 1) 2011-2012 from Perte de Signal on Vimeo. Peter Flemming: Instrumentation (demonstration no. 2) 2011-2012 from Perte de Signal on Vimeo. Peter Flemming: Instrumentation (demonstration no. 3) 2011-2012 from Perte de Signal on Vimeo. An occasional writer and curator, he has produced exhibition texts for other artists, presented papers, organized events and developed lecture series. He is an active board member of several local arts organizations. A graduate of the Ontario College of Art and the Nova Scotia College of Art and Design, Flemming currently lives and works in Montréal, where he teaches electronics for artists at Concordia University. It is the third time Flemming exhibits under the auspices of TEKS.